This post is part of a series on Saving for College— read more about superfunding your 529 and the 4 big things you should contemplate now if you have kids who may be college-bound in the future. Soft skin. Warm snuggles. First smiles. A new baby brings so much joy into your life. And with that joy comes focus — on trying to do everything right, on trying to give everything to your child. One of the things you should be thinking about? Paying for college. By the time today’s newborns leave the nest, the average cost of a four-year private education could be $302,700, according to Wealthfront research. Although that number is undoubtedly daunting — and that future seems unfathomably far away — starting early will give your money time to grow. Here are four steps to take right now. To pay for your child to attend Stanford, you could either save $1,663 per month, over 18 years, for a total of $359,208. Or you could deposit $239,059 today — and let it grow. To pay for your child to attend UCLA, you could either save $720 over 18 years, for a total of $155,520. Or you could deposit $103,439 today — and let it grow over the next 18 years. Note: The future amount required is calculated by taking this year’s tuition, fees, room & board and applying 4% annual inflation (higher education inflation on average is approximately 2% higher than the average increase in the Consumer Price Index). The lump sum required now is the amount needed to invest this year assuming 4.7% investment returns, which is the average net-of-fee annual expected return for Wealthfront 529 risk score 9.0 investment plan, to meet the future amount required at matriculation. This compares to the monthly savings required if you can’t invest via lump sum and instead contribute the same amount every month to meet the goal. Of course, six figures of cash is tough to come by, and won’t be a feasible option for many parents. But the point isn’t how much you put in; the point is it’s incredibly valuable to start with whatever lump sum you can afford. 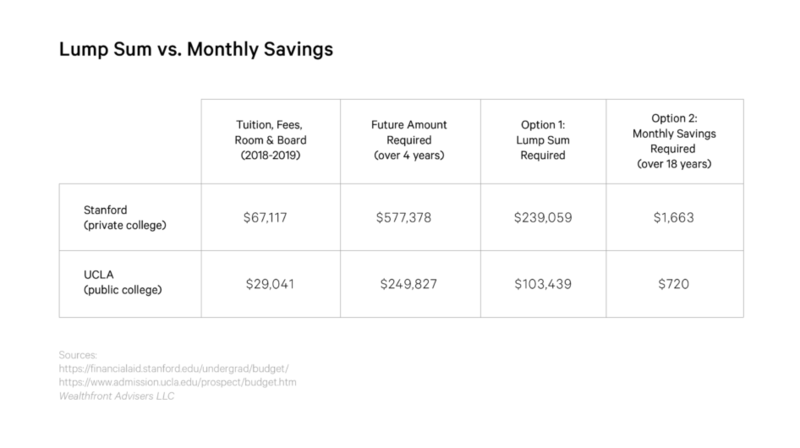 To make your own calculations, log into Wealthfront and use our automated financial planning to estimate the future costs of a particular college, predict financial aid, and create realistic savings goals. Because of their superior tax benefits and relative flexibility, most experts consider 529 plans the best way to save for college. You’ll receive tax advantages: Your money grows tax-free. Withdrawals are also tax-free, as long as they’re used toward tuition, fees, books, room and board, computers, etc. You can superfund the 529: You can make a large, tax-advantaged lump sum investment, which is known as “superfunding.” You and your spouse can each invest five times the annual gift tax limit of $15,000 (for a total of $150,000 per child, per couple) — which would allow ample time for compounding, and give you a significant head start on your college savings goals. You can use it for K-12, too: Under the new tax law, you can now withdraw up to $10,000 per year, tax- and penalty-free, to use for private school tuition. Not all states have gotten on board yet, so check your specific 529 plan before going this route. The biggest downside of 529s? They’re not flexible. If your child decides to skip college, or gets a full-ride scholarship, you could transfer the account to a sibling or cousin. But if you end up using the money for non-education expenses, you’ll owe taxes on the earnings, plus a 10% penalty. If you couldn’t tell already, we think 529 plans are an ideal way to save for college. When it comes to picking a particular 529 plan, you have a lot of options. Each state, plus the District of Columbia, administers its own plans, and you can choose whichever one appeals to you. You don’t have to choose the state you live in, or the state in which you think your child will attend college. If you live in California, for example, you could enroll in Nevada’s plan, and then eventually use the money to send your child to school in New York. For helpful breakdowns of each state’s 529 plan, visit Saving for College. The only exception is if you choose a “prepaid tuition plan,” which lets you lock in today’s tuition at public schools in your state. Since these aren’t very flexible, however, we generally don’t recommend them. By choosing a regular 529 plan, your child can use the money for Qualified Higher Education Expenses at any eligible institution — no matter which state sponsored the plan. State income tax deductions: More than 30 states offer residents state income tax deductions for contributing to their specific 529 plans. Seven states offer a deduction for contributing to any plan — even if it’s administered by a different state. For a full list of state tax policies, read the Wealthfront 529 White Paper. Fees: Management and administrative fees vary greatly depending on the plan. Advisor-sold plans, which usually come with personalized financial advice and active management, are pricier than direct-sold plans, which tend to feature low-cost funds. You’re almost there! Once you’ve decided which 529 plan to use, you’ll also need to decide how to invest the money within it. While a broker or advisor may try to steer you into actively managed mutual funds, we wouldn’t recommend them. Advisors may make gleaming promises of “beating the market,” but research shows that, when fees are taken into account, actively managed funds actually fare worse than index funds. So, as always, we advise looking for index funds and other low-cost, passively managed investments. Within many 529s, you’ll find age-based options that, like target-date retirement funds, automatically adjust their asset allocation as your child gets closer to college. Though this trajectory, known as a glide path, would ideally take your risk tolerance into account, many direct-sold plans don’t personalize their recommendations. Many direct-sold plans also only offer between one and five different asset classes — and according to our research, that’s no good. Additional asset classes can help you earn much better returns in the long run. No matter which strategy and which 529 you choose, we hope you’ll start saving today. We’d say your child’s future is worth it — wouldn’t you? *Source: Wealthfront Research with data from from IPEDS, as of March 2018. For more information about the Wealthfront 529 College Savings Plan (the “Plan”), download the Plan Description and Participation Agreement (to be made available on Plan launch) or request one by calling or emailing support@wealthfront.com or (650) 249-4250. Investment objectives, risks, charges, expenses, and other important information are included in the Plan Description and Participation Agreement; read and consider it carefully before investing. Wealthfront Brokerage Corporation serves as the distributor and the underwriter of the Plan. The Wealthfront 529 College Savings Plan (Plan) is administered by the Board of Trustees of the College Savings Plans of Nevada (Board). The information contained is provided for general informational purposes and should not be construed as investment advice. Nothing should be construed as tax advice, solicitation or offer, or recommendation, to buy or sell any security. Financial advisory services are only provided to investors who become Wealthfront clients. Wealthfront does not represent in any manner that the tax consequences described here will be obtained or will result in any particular tax consequence. Prospective investors should confer with their personal tax advisors regarding the tax consequences of investing with Wealthfront, based on their particular circumstances. The calculation for projected returns is a hypothetical calculation base on backtested data, i.e., a retroactive application of Wealthfront’s investment methodologies. Backtesting has the inherent limitations of not representing actual trading and not reflecting the impact that material economic and market factors might have had on the Wealthfront’s decision­making if Wealthfront were actually managing clients’ money at that time. It also does not take into consideration the effect of changing risk profiles or future investment decisions. Several processes, assumptions and data sources were used to create one possible approximation of how a Wealthfront 529 plan might have benefited investors in the past, and a different methodology may have resulted in a different outcome. The results of this simulation should not be relied upon for predicting future performance and is not a guarantee of actual performance. The return data presented is based on an average Wealthfront high net worth client. The average Wealthfront high net worth investor has a liquid net worth greater than $1 million and a risk score of 7.5 for a static investment plan, i.e., without a glide path. The 529 glide path investment plan with approximately equivalent risk (as measured by average expected volatility) is risk score 9.0, which has an average expected return of 4.7% over 18 years. Actual investors in Wealthfront may experience different results from the results upon which we based our calculations. There is a potential for loss as well as gain that is not reflected in the hypothetical information portrayed. Investors evaluating this information should carefully consider the processes, data, and assumptions used by Wealthfront in creating its historical simulations.